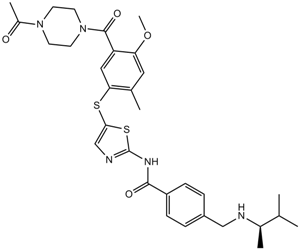 Description ITK inhibitor is a potent inhibitor of ITK. Interleukin-2-inducible T cell kinase (ITK) is a non-receptor tyrosine kinase expressed in T cells, NKT cells and mast cells which plays a crucial role in regulating the T cell receptor (TCR), CD28, CD2, chemokine receptor CXCR4, and FcepsilonR-mediated signaling pathways. ITK inhibitors can be used for the treatment of inflammation and immune-mediated disorders. ITK inhibitor (N-[5-[[3-[(4-Acetylpiperazin-1-yl)carbonyl]-4-methyl-6-methoxy-phenyl]thio]thiazol-2-yl]-4-(N-1,2-dimethylpropylaminomethyl)benzamide) is the analogue of BMS-509744, which can potently and selectively inhibit Itk kinase activity. In vitro: BMS-509744 could reduce TCR-induced functions including PLCγ1 tyrosine phosphorylation, calcium mobilization, IL-2 secretion, and T-cell proliferation in vitro in both human and mouse cells . In vivo: BMS-509744 suppressed the production of IL-2 induced by anti-TCR antibody administered to mice. BMS-509744 also significantly diminishes lung inflammation in a mouse model of ovalbumin-induced allergy/asthma . Clinical trial: Up to now, both BMS-509744 and ITK inhibitor is still in the preclinical development stage. Lin TA, McIntyre KW, Das J, Liu C, O'Day KD, Penhallow B, Hung CY, Whitney GS, Shuster DJ, Yang X, Townsend R, Postelnek J, Spergel SH, Lin J, Moquin RV, Furch JA, Kamath AV, Zhang H, Marathe PH, Perez-Villar JJ, Doweyko A, Killar L, Dodd JH, Barrish JC, Wityak J, Kanner SB. Selective Itk inhibitors block T-cell activation and murine lung inflammation. Biochemistry. 2004 Aug 31;43(34):11056-62.